You are here: Home > HTC HD7 Available For Order From T-Mobile? Almost But Walmart Is Selling It For Cheap! 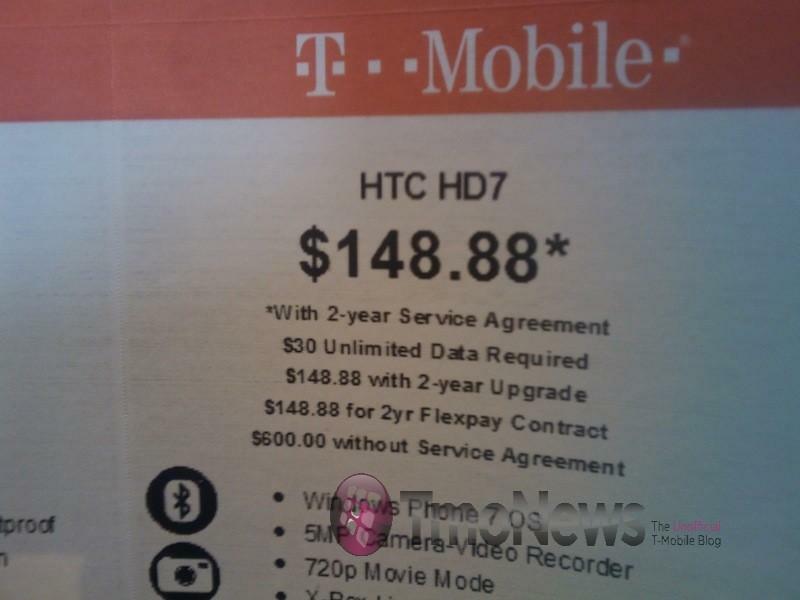 HTC HD7 Available For Order From T-Mobile? Almost But Walmart Is Selling It For Cheap! For those of you who haven’t made up their minds about the HD7 without testing the device, we have some great news, albeit with a caveat. The HD7 is officially listed on the myTmobile.com upgrade page but unfortunately you can’t actually purchase the device just yet. We expect you can do that sometime early next Monday morning but hey, it never hurts to try and sneak it in a few days early. I’ve tried to be an active voice for Windows Phone 7 as so many of you have seemingly written it off prior to actually trying a device which is a total mistake. Nobody is saying it’s better than the iPhone, or that it’s better than Android but if you were a fan on the Windows Mobile of old or just want to take a look at something new, you owe it to yourself to at least give yourself a few minutes with the HD7. Of course if you are looking for the best deal on the HD7, Walmart is kicking down doors the past 24 hours with some serious pricing! so why are all these phones that are coming out on the 3rd or later getting preorders and what now… and the My Touch 4g has only seen the light on Wirefly.com…. Isn’t Best buy, Radio Shack, and other places getting the 4g too? Right. Where my MyTouch??? I’ve been search and going to every retailer I cant find. I will personally go to three radioshacks tomorrow, a bestbuy, a walmart, target, and the tmobile store just to see who will have them in stock when they go on sale…. The retail stores should have quite a stock. I dont know of any inventory problems for the 4g. Concidering they havent been heavily advertised (like most tmobile things) i dont think they will sell out anyways, just be another strong seller like the vibrant and G2. As far as WP7, noone should write it off. It is a far cry from the old windows. its more like if Android met iPhone in a bar, got drunk, and had an illigitimate child, they would call it WP7. It tries to do whats good (and bad) about both. It actualy work quite well. Well I called my local Best Buy Mobile here in Tampa, FL. and I was told they were indeed going to have it… just not in stores, then I tried talking to someone higher on the phone and they said they couldn’t talk about it. So I am desperately hoping it indeed launches Nov. 3rd with Best Buy because I want to use my Best Buy credit card. The mytouch 4g is shown available as an upgrade on tmobile now too. YEAH! Finally, but Ill likely just go to the store… Ill be there first thing Wednesday morning. I know Best Buy and other retailers are going to offer it for cheaper than what T-mobile will. I went through all the checkout stuff and it came to 296 bucks… way too much for me… rather get it for 200 off of best buy or something. you can also upgrade to get the mytouch 4g now also. Are you sure? I have been trying but when I hit the submit button,it doesn’t do anything. Yep got email confirmation :) Try using IE (in compatiblity mode). Wouldn’t work in Safari. Thanks for the tip(to use IE in compatibility mode),was able to preorder and just got a email from Tmobile stating that my estimated delivery date is 11/04(hope that is right). 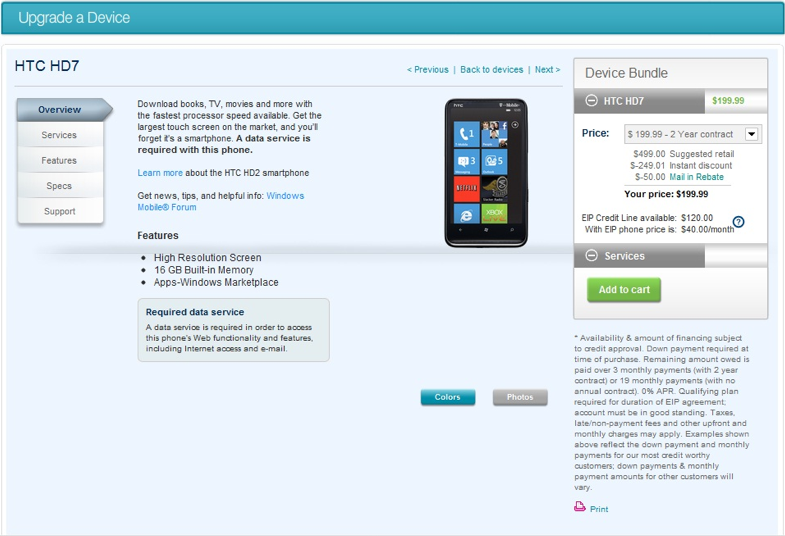 Why in the picture of the website is price w/out a contract $499 but in the picture of a retail tag the phone is $600. Conflicting information much? On contract and off contract pricing will vary between retailers, radio shack, best buy, wal mart, retail, etc. Looks like TMo had a problem with HD2/7 too. I think it will be cheaper actually buying from T-mobile if you want to pay full price because it is $449 from their website but Letstalk is charging $549 and the Walmart deal is through Letstalk. Remember the in-store pricing is different from on-line. The WalMart online pricing is LetsTalk, the in-store is purely WalMart. My experience is that if you are qualified for full upgrade, you definitely want to deal in-store, upgrade pricing is usually better than anywhere else, you don’t need to change your contract (other than to meet data requirements, possibly), the downer is that in-store does not stock all phones, and does not usually have all colors of phones they do stock. i don’t think so they should sell these phone maybe at 99.00 pushing 140.00 so try to recover the loss market.. I wont pay 200 for any phone with no even decent app market..
Have fun being locked into contracts for the rest of your life. NO PHONE IS $200. Its only $200 when you sign your life away into a contract… its the discount you get for signing a contract. Every new phone from HTC, Samsung, etc, REGARDLESS OF OS retails for $450 – $800. Even the iPhone’s MSRP is around $400 – $600. Don’t be facetious, it just makes you a troll. Lets see how long WP7 last before MS abandons it. I am a Windows Mobile fan but this new OS is made for kids. The WM model was always aimed at the business user. MS will take a loss on this. …but I’ll give the OS a try as soon as XDA drops the rom for the HD2. hmm i dont see the HTC HD7 on the upgrade screen. is anyone seeing it? I never saw it and I’ve been checking daily so I could order as soon as it’s available for me. I see the MT4G, bur I already have a Nexus and I don’t want another Android right now. I WANT THE HD7!! !